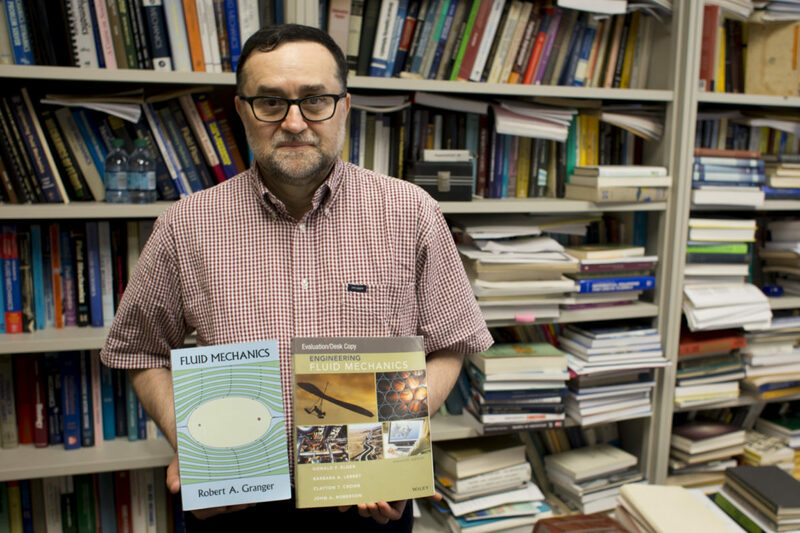 Dr. Cesar Mendoza with the original textbook for his civil engineering class (right) and the less expensive replacement (left) that he used this semester. With the rising cost of college textbooks adding to many students’ debt load, the University of Missouri System is encouraging faculty to explore using more affordable and open educational resources – low-cost or freely accessible, openly licensed text or media for teaching and learning. The UM System initiative – known as Affordable and Open Educational Resources, or AOER – has encouraged Missouri S&T professors to switch to less expensive or even free textbooks. During the 2018 spring semester, Mendoza switched textbooks in his Civil Engineering 3330 class from a book that cost $145 to another text that cost $35. The class averages about 210 students every year, which means he saved students a total of about $23,000 annually. Mendoza switched to a publisher named Dover, which republishes books after their original copyright expires. His original textbook was out of print, but Dover started reproducing a soft-bound version with black and white illustrations. Mendoza says the quality of the content is still excellent, even without today’s textbooks with colorful illustrations and layouts. His students agree. Several S&T professors even switched to free online textbooks to save their students money. Erica Dixon, a senior in economics from Shelbina, Missouri, says she started choosing classes based on her options for less expensive textbooks. She was pleased to find S&T professors working to reduce the cost of their books. The book used in Fikru’s economics class was out of print, but the university publishing system was able to secure permission from the publisher to photocopy the text. It dramatically reduced the cost of the book. More faculty are considering ways to do just that. Every course that I taught for 13 semesters (and I taught six different courses) in the class room and all the classes that I taught on line for 13 years, I prepared for the student complete lecture notes where all the information that they needed to learn was in the lecture notes. In some cases, there was a text book, but the student did not really need it. As an example of what I did, I scanned nearly a thousand pages of material that that I wanted them to look at and condensed it down for handouts. I encourage them buying a book it if they could for their future, but they did not have to have it. I realize that there are some classes that may be an exception, but I did not find one. I have been looking for cheaper textbook alternatives myself as a student.